It’s now only six days to go until our Sausage Saturday open day next week on 22nd October. Between 1pm and 4pm we will be opening the doors to our smallholding for local residents to come and meet our small menagerie of animals and taste some of our superb sausages. Preparations are well underway, and our three Berkshire pigs went off on Wednesday to the great big pig pen in the sky, and are now being hung in our butchers cold room developing the most amazing flavour and texture. Although as always we were sad to see them go, the excitement of stocking our freezer for thewinter months and tasting our home reared pork and crackling is now starting to build up. Next Wednesday our butcher will be professionally cutting and individually vacuum packing all the joints and making sausages to our chosen recipes, ready for sale on Saturday. 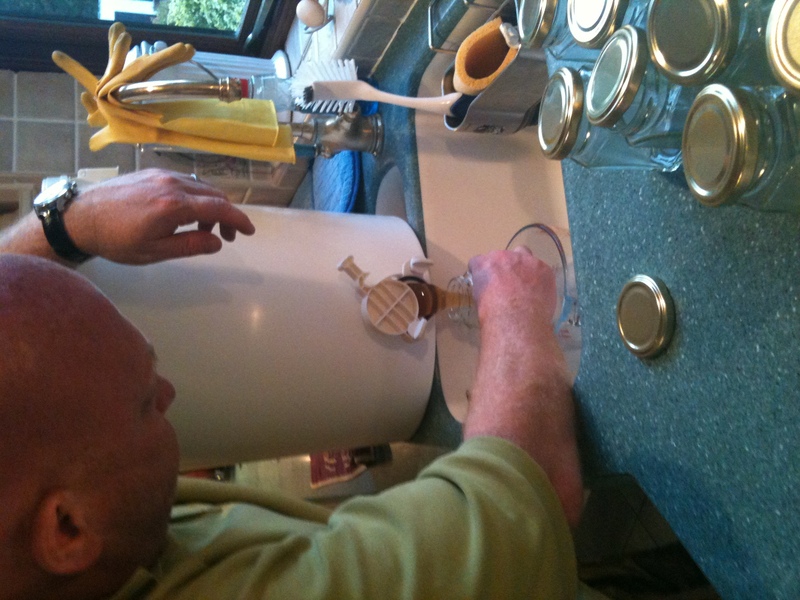 Last week we undertook the task of extracting some honey from our Bees and pouring it into jars. We were sure to leave enough behind for the Bees to use over Winter, and we still got 50 jars of what can only be described as liquid gold. One neighbour who bought two last week has finished them both already ! pork@ heatherhurstgrange.co.uk, or visit our website www.heatherhurstgrange.co.uk for more information. Our address and directions will be emailed to all of those who’ve registered during next week. If you can’t make it on the day, but still want to place a sausage order I will be delivering to some people locally in Surrey Heath on Sunday morning so please let me know. 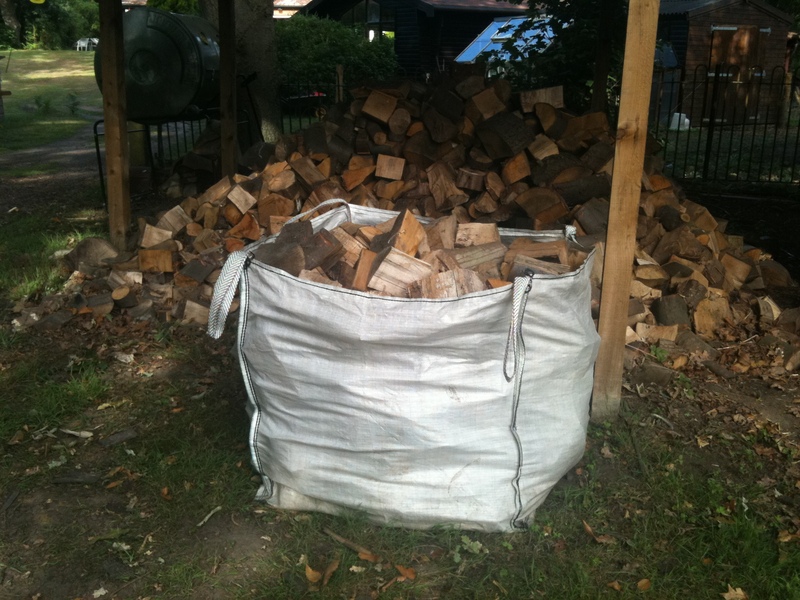 Heatherhurst Grange Blog is re-born…. Sausage Saturday is an informal open day and an opportunity to come and try our sausages made from our very own home produced pork, and meet some of our pigs. It’s been nearly 12 months since our last blog, not due to lack of interest nor activity, simply lack of time due to pressure of work in tough economic times. Running our small holding whilst holding down a full time job has proved challenging but rewarding in equal measure, but has left no time to publicise our exploits to the local community. During the last year we have continued to rear our herd of rare breed pigs, our geese and chicken flocks, as well as our turkeys and bees. Our passion for producing high quality, good value and locally reared produce right here in Surrey Heath has never faltered and during the last year our friends and neighbours have supported our endeavours throughout, enjoying our produce with us. Due to increasing demand, we feel it is now time to re-launch our project to the local community and hence our blog will be re-invigorated and published every month, along with regular tweets, and more frequent open days to keep the people of Surrey Heath in touch with what local and sustainable food production really means. 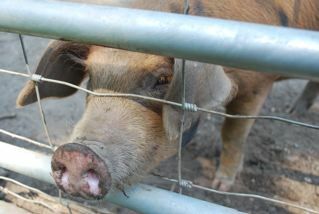 On Sausage Saturday we will have our sausages, pork joints and our very own honey for sale all sourced here in Deepcut. Whether you want to buy some of our produce or just pop in to meet the animals, as Surrey Heath Residents you are welcome either way. http://www.heatherhurst grange.co.uk/events for more information. All four of our geese are getting fat, but the good news for them is that they are being kept to provide a bounty of goose eggs next year. Our Turkeys on the other hand are also getting fat, but the future isn’t so rosy for them. All of our Turkeys that we bought back in the summer as day old chicks have been lovingly reared and are destined for the festive table at various households in the area. 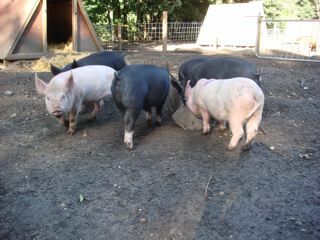 The rate they have grown at is phenomenal, and having run around freely through the summer and autumn in our middle paddock being fed on grass, corn and premium feed, I bet that not only will taste delicious but having come from Wildcroft Rare Breeds at Puttenham they will have only travelled minimal food miles. As the cold weather sets in, life as a smallholder becomes more challenging, as in addition to twice daily feeding and provision of fresh water, all the ice has to be broken on the water troughs and with frozen outside taps getting the water to the animals is extremely problematic. At this time of year, with the lack of natural forage, our bees require a weekly supplement of fondant in their hives to ensure they maintain enough energy to survive “over winter” and maintain the queen’s health for the population explosion which will start in the spring. On the pig front, we have three Berkshires that are going in for pork and sausages to supply the Christmas demand, and we still have some availability (see our ordering page for details). Our Oxford Sandy and Black will go for ham’s, bacon and cured porky delights in the spring and our middle white gilt Pearl, is growing at a pace and will be ready for the boar in the spring in the hope of our first litter of Heatherhurst Grange bred piglets in early summer 2011. Finally our two Kune-Kune’s, Gloria and Delilah seem to do nothing more than eat, sleep and eat some more, so next year they will need to earn their keep as breeding sows too. Other high points from the year include; the massive success of our honey which we sold out of within a week of harvest, we added spiced apple chutney in our porky parcels (recipe courtesy of the WI and apples from our neighbour), and in the summer we ate the first complete meal produced entirely on site, and have delivered multiple orders for logs. We aren’t quite at “Tom and Barbara” good life status yet, but our efforts have started to yield really rewarding results for us and provided high quality produce with local provenance to some very supportive friend’s, neighbours and locals. Next year will bring the introduction of our breeding plan with the sows, creation of a fully functional vegetable garden and the modest expansion of our livestock holding to meet steadily growing demand. Thanks to everyone who has supported us or followed our progress this year, and as we move into what will be a tough 2011 from an economic perspective watch this space for ways to enjoy high quality, cost effective locally produced goods from Heatherhurst Grange. 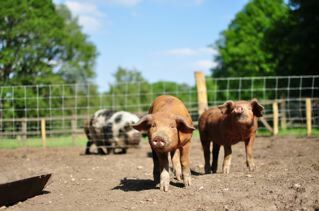 August has seen our pig herd and poultry flock grow to near capacity, and it is satisfying to see a wider variety of creatures enjoying life at Heatherhurst Grange. Mid August saw the arrival of four beautiful Berkshire piglets, closely followed the next day by two registered pure bred Middle Whites gilts, Snowdrop and Pearl. After experiencing the sublime quality of Middle White Pork we have decided to breed and Snowdrop will be our first breeding sow, who will be old enough in the spring to start producing her own litters. Pearl has been sold on to Graham and Tracey at Wildcroft Rare Breeds, but we can’t move her for 21 days due to DEFRA guidelines, so she’s lodging with us for now and keeping Snowdrop company. In order to create more space and give them a fresh green patch we’ve moved our chicken flock to join the Geese in the bottom paddock and they are relishing fresh green grass and a much larger enclosure. Egg production remains high, and although we aren’t licensed to sell eggs we have been giving them to neighbours who in return have provided lots of fresh veg and apples to feed us and our pigs. 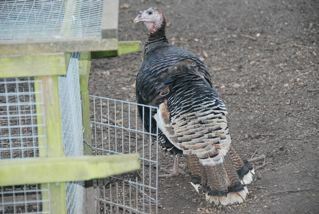 At the start of the month our Turkeys arrived and having had their wings clipped have settled in nicely in a large new enclosure in our middle paddock away from our chickens as they cannot be mixed. They eat a huge amount of feed, and are doubling in size almost every week, which is most probably why they are more popular than chicken for the festive season. As with all our livestock, we’ll ensure they have a happy life between now and then. August has provided the most exciting day of the year for us so far, with the extraction of our first ever Honey crop. It appears to be quite a complex and messy process but in reality it was straightforward and very satisfying. 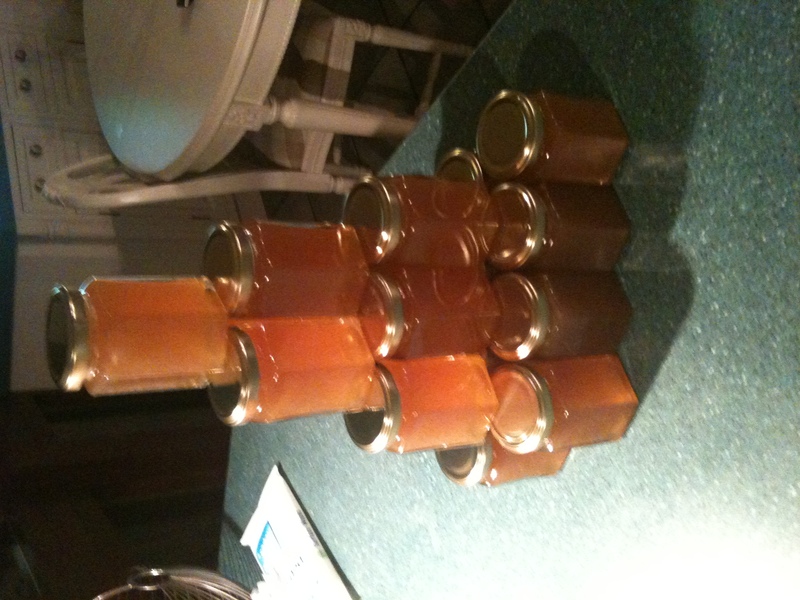 The Honey is absolutely delicious and all 30 or so jars sold like hot cakes in a matter of days! Now that we’ve harvested this year’s crop and our colonies are a full population, we’ve treated all our hives for Varroa, so fingers crossed they’ll survive until the spring. Our twice daily feeding routine is getting longer and longer as we now have a total of 11 pigs, 8 turkeys, 4 Geese, 17 Chickens, Dog, 2 Cats, and a pond full of fish. Soon we’ll have to add the bees to the list for a weekly supplement of feed to help them over the winter. September will see our Oxford Sandy and Blacks go off to Laverstoke at the end of the month, to stock our freezer for autumn along with those of our local customers. We still have a couple of quarters left, so get in touch if you are interested in trying some locally produced, high quality rare breed pork. Once you’ve tried it you’ll never buy supermarket pork again !!! July has been a busy month at Heatherhurst Grange. The long awaited departure of our Middle Whites finally came around and we, along with some local customers got to taste what had been rumoured to be the ultimate pork pig. Having tasted 4 or so rare breeds, in my opinion the Middle White tops the pork league table by far. Less fatty than other breeds (although all rare breeds produce more fat than commercial pigs), the meat was a beautiful colour, texture and taste. We think Middle Whites will be one of our breeds of choice and now the search has begun to find a perfect Middle White sow we can breed from. In addition to all our regular customers ordering quarters, we dedicated a whole pig to sausages in order to fulfil demand for the BBQ season. Within 2 days of a mention on the Surrey Heath Residents web blog, we’d sold out and I spent a whole day last week delivering to local people. Our remaining Oxford Sandy & Blacks have been having a whale of a time and one of them has turned into an escape artist. Twice she’s managed to burrow out of the pen, and run amok in the garden. In one incident whilst chasing her I took a tumble and stretched my cruciate ligament. The doctor was highly amused at the tale of my injury. 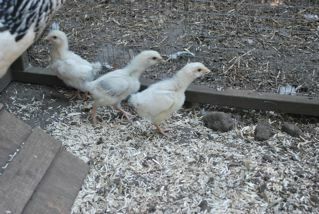 In other developments our hens strangely stopped going in to their house at night, and seemed a bit lethargic. Upon closer investigation we discovered the presence of dreaded Red Mite, a parasite that can be fatal to chickens. Back in the spring we took in some hens from a breeder in Hampshire that must have been infected, and they spread to one of our flocks. As a result we’ve spent the whole month systematically treating our hens to destroy the Red Mite colony and after a month of catching and treating the birds and pressure washing the hen house regularly, we think we’ve beaten them. Yesterdays hive inspection of our three colonies confirmed that our hives are packed full of honey. As a result the largest hive has been rearranged to force bees down deep into the brood box so that next week we can remove the top box (or super) and extract and jar our honey. This years attempt at elderflower champagne was a great success and unlike prior attempts we produced a highly drinkable sparking wine with very little effort at all. 4 bottles exploded during the fermentation process causing a real sticky mess (probably not as messy as next weeks honey extraction), in our store cupboard but the remaining bottles were a real treat and are nearly finished. Having spent all those long winter nights wishing for summer, here we are in the height of summer planning for Christmas. 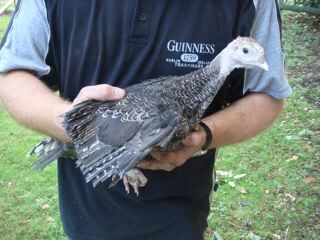 In mid August our turkeys will arrive to be reared over the autumn in readiness for the Christmas table, so all enquiries welcome but we must have confirmed orders by 10th August for anyone interested, and in another step towards the end of summer we’ve taken our first few orders for log deliveries, so in addition to honey extraction and turkey fencing, we’ll be getting the log splitter out of mothballs and into service during August. Since our last blog nearly a month ago, we have had some more new arrivals. 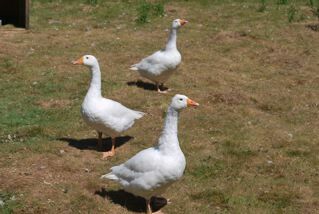 In addition to our Oxford Sandy & Black piglets who arrived at the end of May, our menagerie has been grown by the arrival of three French white geese, who have taken up residence in the bottom paddock, and both our Light Sussex hens have successfully hatched eggs, so there are four very cute chicks to add to our flock. Egg production is now at its highest level of the year so far, and after this weeks hive inspections, our bee colonies are bursting with honey due to be extracted in the next few weeks. We’ve also just pulled our first potato crop and for the first time since we started out we have home produced supplies in abundance. I’m starting to realise what all of the hard work through the winter is all about and with a large bucket full of elderflower sparkling wine fermenting in the utility room, waiting to be bottled we should soon be able to sit down and enjoy our first complete meal produced entirely on site; honey roast ham, egg, potatoes and salad washed down with our home made sparkling wine… Not the most elaborate of culinary delights you might think, but every ingredient produced and supplied by the amazing creatures we look after here, or grown in our own soil, it will taste magical. Next week heralds the departure of our Middle White pigs, and as ever whilst we’ll be sad to see them go, as they are renowned for being the supreme porker I can’t wait to taste the pork they produce. We still have a couple of quarters left due to regular customers being on holiday, and the good news is, due to our expanding herd and the reduction in feed by buying in bulk we have reduced the cost of a quarter box of pork to just £85. That works out to around £3.40 per lb, which is comparable to most supermarket prices, but for a product that is entirely superior, not to mention the minimal food miles and happy and healthy lives these animals have led. If you interested let us know, as delivery will be week commencing the 5th July. You can find details of the contents of a quarter box on our ordering page. Next week we’ll start planning honey extraction and offering jars for sale locally, so if you like honey, or are a hay fever sufferer living in the area watch this space as eating honey from bees foraging pollen collected locally is reputed to increase immunity.